Apologies this blog is so very neglected of late - been on the sick list and now we are moving house (again!). All my art gear is packed away and I'm busy, busy, busy. I am rather happy because one of my paintings just took out 2nd prize at a local art show (in the watercolour section). First prize went to one of Canberra's most well known watercolour artists, Isla Patterson. I can't wait to get back to creating again, but it will be a few more weeks before I can start to unpack the art gear and have any time to get stuck into things. I have temporarily closed down my Artfire and ETSY sales sites until after the move as everything for sale is also packed, but you can purchase art reproductions and other items featuring my work at my new Red Bubble shop. It is unlikely we will have internet for a few weeks, possibly not until end of October, so until I return online. 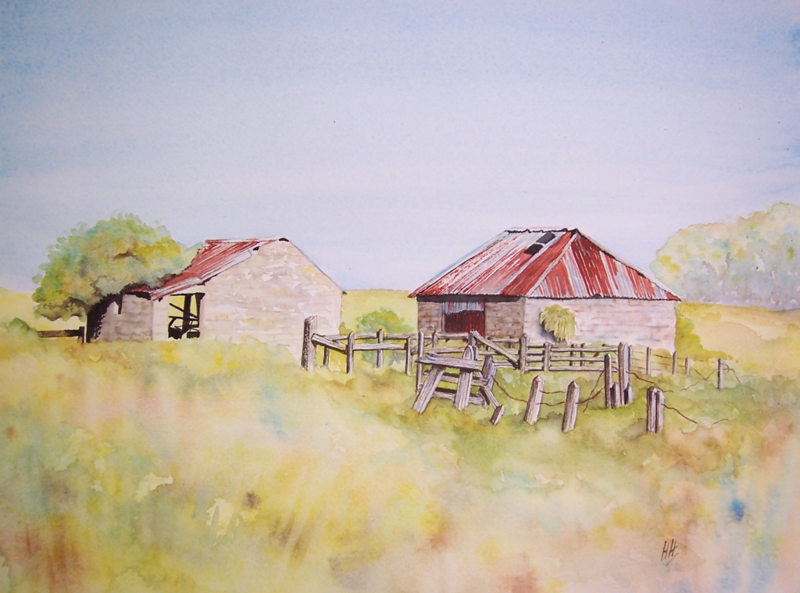 Below is the painting that won 2nd prize "Old Ruins Near Bordertown." I've just added a new painting to my gallery on this website. It is the last painting I completed prior to my leaving South Australia to live in the ACT (Australian Capital Territory). Entitled "Afternoon Shade", it is a landscape featuring some cattle resting in the shade by a desert billabong, probably in the Flinders Ranges, Arkaroola or perhaps the areas out from Alice Springs. It was inspired by a photograph amongst a pile of photos I happened to find lying around in the art workshops. They had been brought in by someone and left there for artists to look at and use and unfortunately the exact location was not written on the back of it. So much of central Australia looks like this painting and it reminded of many of the areas I have visited over the years, especially when looking for gems and minerals in northern South Australia. It is very hot in the afternoon and most animals, native or livestock, tend to seek shade from the burning heat. There are often small rock pools with permanent water throughout the ranges in the mid north, which are frequented by a variety of birds and animals. In my painting I confess that I have used a bit of poetic licence and made the water blue - in reality it is usually either brown or green with algae. 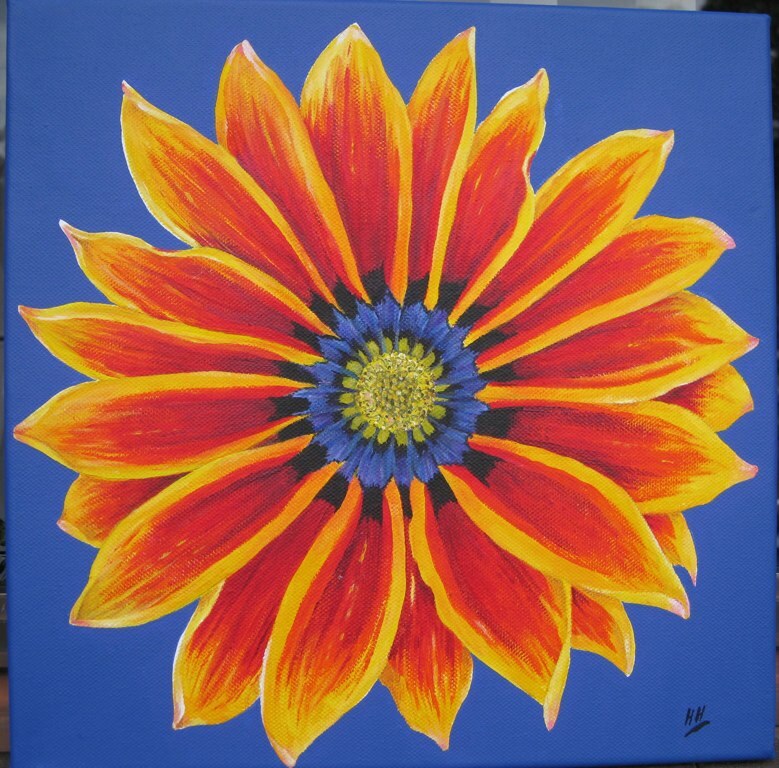 Anyway, I've added it to my gallery page on this website and if anyone would like to purchase it, they can do so from my Artfire site. I have been in Canberra now since 12thApril and am gradually settling in. Canberra is certainly a very beautiful city and I am sure once I feel less like an alien I will grow to love it. At present, I just keep getting lost all the time and have not yet had time to hunt up any art groups or even unpack my art stuff. I confess to being a little worried about -10 degrees in winter - sounds awfully cold to me and maybe for the first time in my life I might get to see snow. Anyway, cheers for now. Sorry this has been a very neglected blog as of late. The only painting I've been doing is on the house! I have resigned as editor of the PCAC newsletter due to my move to Canberra, which happens next week, but the job has been taken up by talented SA artist Emerson Ward. Emerson is a talented artist who recently published his first art book and is a new member of the PCAC board. His first newsletter , Edition 37 for April 2013 can be viewed on the Newsletter Archives. I am very grateful to Emerson for stepping in and volunteering to be the editor. I enjoyed being editor and am sorry to be leaving. 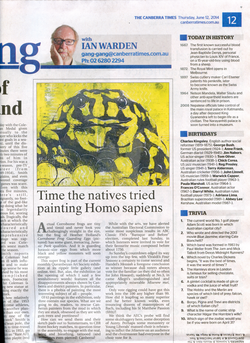 Hopefully I will find a new art society to join when I get to Canberra. If you are in South Australia, check out the National Railway Museum Art Show if you get the chance. - they have received entries (including a small one from me) from all around Australia - a must if you love art and trains. I will be unplugging the faithful old Mac this Sunday and be offline for at least a week, so may not be able to reply to emails etc. Keep enjoying your art and cheers from Adelaide (for the last time). Congratulations to Ursula Wright on winning a prize at the recent SALA'd Days exhibition at Port Community Arts Centre. Ursula's watercolour painting "Fruit Ensemble" was well received by the judges. Well done Ursula. I will ask Ursula if she can send us an image of the painting so I can put it here for you to see, but in the meantime you can see some of Ursula's other work in her gallery on this website.. Cheers. Sorry this blog has been a bit neglected lately - been busy and sick to boot. Just popped in today to let you know about a new class starting up at the Port Community Arts Centre on Tuesday 30th October 2012 entitled Introduction to Etching. The class will be from 7.00-9.00pm for 8 weeks at a cost of $145 (materials not included) and it should be great. It is being run by Tony Lusk. Tony Lusk is a practising Artist who works in the mediums of Drawing and Printmaking and has had numerous solo exhibitions in South Australia and Western Australia, as well showing in major group exhibitions both nationally and internationally. He has a Master of Arts majoring in Printmaking from the University of Iowa U.S.A. and a Bachelor of Education from the University of South Australia. He is an experienced art teacher, having taught for 22 years in tertiary institutions. If you are interested in learning printmaking from an expert, contact Tony direct on 0415510731 or bluedwarf@live.com.au for further information.